PRISM MARKETING CONSULTANTS || SEPTEMBER 8, 2015 || Staying true to his new modus operandi of doing whatever is necessary to assist in the upliftment of youths, recording artiste Aidonia last week returned to the island following a sojourn in the twin island republic of Trinidad & Tobago where he performed at a Youth rally at Valencia Recreation Ground in Sangre Grande. The Jamaican was the specially invited guest of that country’s Minister of Sports - Brent Sancho who spearheaded the campaign. Aidonia says he was very honoured for the opportunity to not only perform for the youths but also impart positive messages that could apply to their everyday life. “Firstly, I have to say respect to the Trinidadian government for reaching out to my management team on such an endeavour. The show was great and my performance was well received but the greatest thing is that the people came out and got an opportunity to take away something positive from the rally”. – Aidonia said. Back on local soil, last Wednesday the 4th Generation boss in collaboration with 21st Hapilos Distribution hosted a media launch for his debut EP dubbed ‘Project Sweat’ at the LimeLite Night Club in Half-Way-Tree. The event saw several prominent media houses and a flurry of entertainers and entertainment personalities in attendance among those spotted were Munga Honourable, Dre Island, Chi Ching Ching, Devin Di Dakta, Bramma, Chino, Zj Liquid, ZJ Sparks, Foota Hype, Boom Boom, ZJ Dymond, Team Cashflow, Deablo and the 4th Generation family among others. from infancy to present before elaborating on the conceptualisation of ‘Project Sweat’. The proceedings culminated with a vote of thanks accompanied by some energized performances from the aforementioned entertainers. 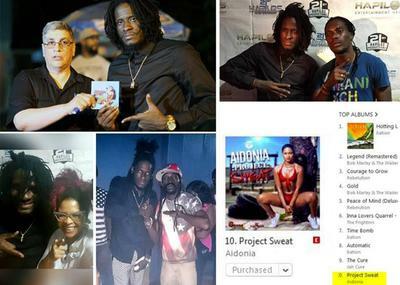 Executively produced by 4thGenna Music ‘Project Sweat’ features eleven tracks exclusively for the ladies and is now available on all major digital platforms. “On behalf of myself and the 4th Generation family I want to say a special thank you to everyone that came out to the official launch of Project Sweat at LimeLite Night Club and showed their support, it was greatly appreciated. Respect to everyone that played an integral role in the realization and success of this project from 21st Hapilos distributions, all the producers, engineers, radio & street jocks, media personnels, promoters, artistes, my management team and family who worked tirelessly and last but by no means least the fans who have continually being loyal to me throughout the years as you know without you there would be no Aidonia. Just know this is the start of a great movement so let us all unite in the name of Reggae and Dancehall and support each other in all our endeavours”. - Aidonia added.